A spiritual center by Ghous-e-Zaman Ala-Hazrat Baba Ji Khawaja Muhammad Qasim Sadiq (RA) (b. 1263 A.H.). Hazrat Khawaja’s ancestors were migrated from Iran and setteled in Rawalpindi District of Pakistan. Hazrat Khawaja Sahib was the Ghaus-e-Zaman of his time better known among the great Sufis as the Spiritual Sun on the horizon of the East. Hazrat Khawaja Baba Ji’s 120 years of life forms a proud chapter of Islamic renaissance in this region of Asia. The order of Sufis (Mystics or Sainthood) preached by the Khawaja Baba Ji Sarkar (RA) and continued by his family today is Naqshbandia, Mujadidia and Qasmia. 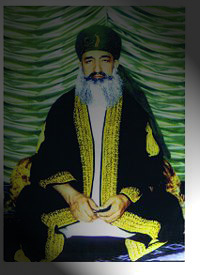 Baba Ji Sarkar (RA) was given permission from his Murshid His Holiness Khawaja Nizamuddin Aulia of Kahiyan Sharif in four orders – Chistiya, Qadriya, Suhrwardia and Naqshbandia. But Khawaja mainly preached Naqshbandia and Qadriya orders. From the very childhoood he had established his inquisitive brilliance of mind and thought. For higher education in Islamic jurisprudence (Fiqh) and Sharia he underwent long journeys to various centres of Islamic learning at the time. At the early age of twenty he had completed his education in various disciplines of Islam. After education attainments he devoted himself to prayers and preaching the message of Islam. (His Holiness) Baba Ji Sarkar (RA) was a professional wrestler before he became he received his higher Islamic education. He used to win all the competions and was very famous wrestler. One day when he won the competion as he was coming out of the fighting ring, an old Saint was passing by who said to him “Allah has not created you for this, you have to serve a very big purpose”. At this point in his life he stopped wrestling and went to receive his higher education as explained in “His Holiness Baba Ji Sarkar (RA)’s Education” section. His Nobleness Hazrat Baba Ji Sarkar (RA) undertook onfoot journey and received spiritual inspiration from his Murshid (Guide) His Holiness Ghous-e-Zaman Khawaja Nizamuddin Aulia of Kahiyan Sharif in Neelam Valley, Kashmir. 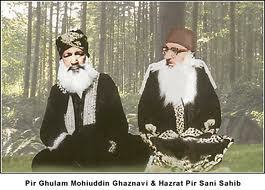 The Murshid acquainted his disciple with all the stages of spiritualism at a single glance. And after spending few days at the Dargah of His Holiness Ghous-e-Zaman Khawaja Nizamuddin Aulia, the Baba Ji Sarkar (RA) was bestowed with Khilafat and asked by his Murshid to take his sojourn at Mohra Shareef, Murree. At that time this place was not as it looks today. It was the habitat of savage wildlife like leopards, lions, etc. The Baba Ji Sarkar (RA) according to the advice of his Murshid Paak undertook a 40-day spiritual ordeal (chillah). The stone slab on which the Baba Ji Sarkar (RA) sat for 40 days (day-and-night) is preserved even today as a relic (Taburrak) at Mohra Shareef. Who new at that time that Fortune was working silentl to bring brilliance and worldwide fame to Mohra Shareef.The place became a permanent abode of Khawaja afterwards. It was here that he spent the rest of his life. Millions of devotees assemble every year at this Centre to pay homage to the auspicious soul of His Highness the Khawaja of the East, Hazrat Pir Muhammad Sadiq (Baba Ji Sarkar) (RA) – The Lion of Allah and the Patron Saint of the East. During his lifetime he brought thousands of Non-Muslims to Islam specially the region of Kashmir including Kotli who was largely inhabitant by Hindus at that time. It was Khawaja who brought these people to Islam. Apart from offering obligatory five times a day prayers the Khawaja would offer one thousand “nowafil” (optional prayers) each night beside other routine prayers (like Tahujjud, Ishraq, Chasht (Salat al-Duha), Awabeen). Also whenever he took a step he would do Zikr (Rememberance of Allah) Isim Zaat (Allah Hoo), with right foot at each step he inhale Allah and exhale Hoo when placing his left foot. He also adviced his Mureeds (disciples) to do Zikr Ism Zaat (Allah Hoo) and Zikr Nafi Asbaat (first Kalimah Shareef) besides the obligatory prayers. It was his usual practice to hold preaching court (Darbar Shareef) to impart spiritual education to the devotees. Special stress was laid on faith fortification and on instilling the lesson of Tauheed (Oneness of Allah). His Holiness Hazrat Baba Ji Muhammad Qasim Sadiq Passed away on the 20th November of 1943 leaving behind millions of disciplines and devotees to mourn him. His funeral prayers were offered three times on the day of his demise due to ever swelling number of mourners attending his funeral. Bengali Shareef, Baghdara Shareef (Saalak Abad – Hasan Abdal/Pakistan) , Narian Shareef (Azad Kashmir), Kanara Shareef (Jehlum/Pakistan), Lakhan Shareef (Lahore/Pakistan), Kotgullah Shareef (Chakwal/Pakistan), Gamkol Shareef (Kohat/Pakistan), Tore Shareef (Abbotabad/Pakistan), Kheewa Sharif (Punjab/Pakistan), Pir Syed Irani Shah Sahib (RA) (Hyderabad/Pakistan), Baba Ferouz Din (Khairly Snoute, Azad Kashmir), Syed Shah Hamdan (RA) (Danda Shah Balawal/Pakistan), Khalifa Abdul Majeed Sahib (RA) (India), Haji Malang Baba (RA) (India), Baba Ghulam Yaseen (RA) (Khanewal/Pakistan), Peer Muzzamal Shah Sahib (RA) (Sargodha/Pakistan), Peer Vilayat Shah Sahib (RA) (Pakistan), Peer Fazal Hussain Shah Sahib (RA) (Puran/Pakistan), Haji Rukn-ud-din (RA) (Sargodah/Pakistan – Khadim Haram-e-Paak for 13 years), Hakim Fazal Kareem Qasmi Sahib (RA) (Sargodah/Pakistan), Moulana Ghulam Rasool Sahib (RA) (Nurdi/Pakistan). 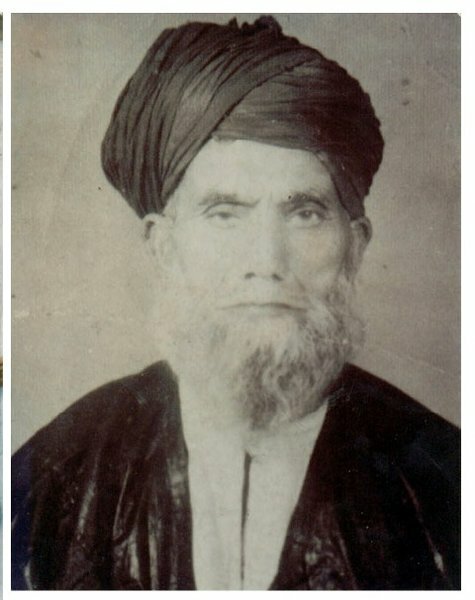 Peer Sahib Sawat (Medanak Madain/Pakistan), Sain Allah Ditta Sahib (RA) (Tandar Sharif, Pimbhar, Azad Kashmir), Sain Fateh Muhammad Sahib (RA) (Punjab/Pakistan), Khalifa Younis Sahib (RA) (Srinagar Kashmir), Sain Alif Din (RA) (Azad Kashmir),Sain Mungoo (RA) (Azad Kashmir),Haji Ghulam Muhammad(RA) (Srinagar Kashmir), Baans Brailey Sharif (India ) , Balawara Sharif ( Kotli Sattian ) , …… and many more. Pictures of Some Khulfas Alayhi Rahma that we currently have .